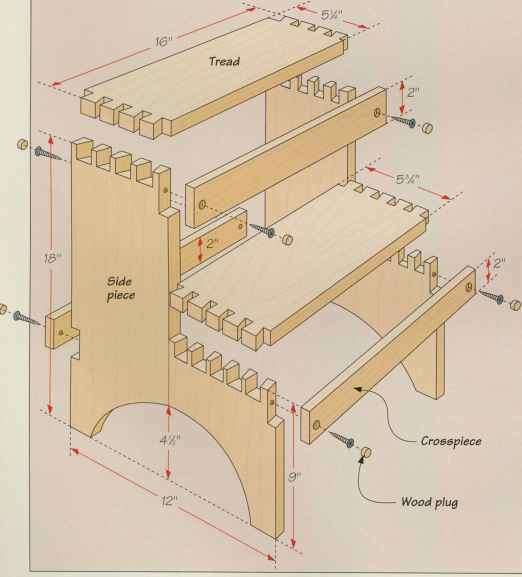 In order to fit together properly, the four assembled sides must be beveled on two opposing edges, as shown in Figure 3. Set your saw blade to cut 45 degrees off vertical, and bevel two opposing edges on each of the four assembled sides. Note that the bevels on each side are mirror images of each other. Cut one 10-1/2-inch-square bottom (C) from 1x12 pine. Place the bottom (C) on a level surface. Then fit the four paneled sides around the bottom (C), matching the beveled edges. Glue and clamp the assembly together, and let the glue set up for a couple of hours. To reinforce the joints you have just glued, drive 3-penny finishing nails through the face of each side into the beveled edge of the adjoining side. Use about three nails for each joint. Also drive nails through the lower face of each paneled side into the edge of the bottom (C). Again use about three nails on each side. Countersink all of the nails.